At the outset, I extend a warm welcome to all the participants of the International Conference on 'Inclusive Museums'. The theme for this year’s conference, 'Museums as Civic Spaces', is extremely apt. I am happy to note that India has been chosen as the venue for this important conference in which eminent museologists from India and twenty one other countries are taking part. The choice of India as the venue for this conference is also most appropriate as India has had a tradition, since ancient times, of having our sculptors and painters offering their masterpieces to the Divine at our temples. Our temples were like multi-purpose museums- seats of learning, studios for artists, workshops for craftsmen and halls of music and theatre for dancers. Inclusive and equitous growth has for long been the cornerstone of India’s developmental efforts. It is, therefore, only appropriate that this eminent gathering is today deliberating upon generating new ideas and actions for bringing in the concept of inclusiveness in the domain of culture, an area in which museums play a dominant role. We know as students and observers of history that conflicts erupt, borders undergo change, regimes disintegrate, alliances take shape and new identities are established. Objects, beliefs and ideals become an integral part of our heritage - tangible and intangible- and are displayed in museums as a reflection of the history of mankind. A great museum is, in fact, a school where we are imperceptibly initiated into history, geography and culture to which the works of art belong. Museums adapt to a dynamic, continuously changing societal scenario and respond to audience expectations. They no longer serve as places for casual visits but as spaces for experiencing our social and cultural heritage. We, as individuals, live in a rapidly changing, ever- evolving society. As a consequence of this state of dynamic flux, museums also face new challenges which seek to change the way they work and carry out their mission. Museums, both old and new, are thus redefining their philosophy, rescheduling their activities and are transforming themselves in order to better carry out their traditional as well as new age responsibilities. Museums, the world over, are witnessing fundamental changes in concept, approach, presentation, management and communication. Attractive architecture, inviting displays, visitor-friendly communication tools and visitor- centric planning are replacing the traditional planning parameters which were limited only to collection, conservation and passive display of artifacts. It has taken more than a century to effect this transformation from royal and feudal museum collections restricted to only a handful of privileged persons to the museum as a public space, open to all, displaying the art and culture of its people at large. Artifacts have been gradually supplemented by contextual stories thus turning the traditional object-based museums into activity-oriented participation centers. In this context, I would like to make a special mention of the new genre of story-telling museums that are coming up in different countries including our own. In contrast to object-based museums, such places are event-based where relevant stories are woven around artifacts and presented in story-telling format with the help of newly emerging digital technologies. Animatronics, virtual and augmented reality, holographic projection, laser and electro-luminescence have never been so effectively used in history museums for story-telling. People have seen brilliant story-telling museums in Mount Vernon or the Lincoln Museum in USA. In India, an experimental venture in the Town Hall of Kolkata inspired the setting up of a state-of-the-art story-telling museum in the Indian Parliament focusing on the democratic heritage of our country. I would also like to share with you the latest developments about a story-telling museum that we are creating within the President’s Estate as aninclusive museum for the people of India. One major challenge that we faced while conceptualizing this museum was locating the more than 10,000 square meters of exhibition space required within the Rashtrapati Bhavan Estate which had been declared a Grade 1 heritage structure in 2009. This was innovatively handled by having a large part of the proposed museum underground, without disturbing the century-old architecture on the top while maintaining the overall aesthetics and architectural heritage of the Estate. The second challenge was to weave a fascinating story, which would both captivate and educate the audience, with Rashtrapati Bhavan itself being the story teller. With the help of the latest digital techniques of animation and simulation, some of which I mentioned earlier, Rashtrapati Bhavan, as the narrator, outlines in detail the planning and construction of the new capital of India, of its transformation from being the symbol of colonial power in pre-independent India to being a metaphor for independent, democratic India - inclusive, happening and aspirational. The rich collections of paintings, arms, furniture and decorative art specimens supplement this digital story-telling. The museum, when completed next year, would possibly pave the way for making other museums in the country more inclusive. 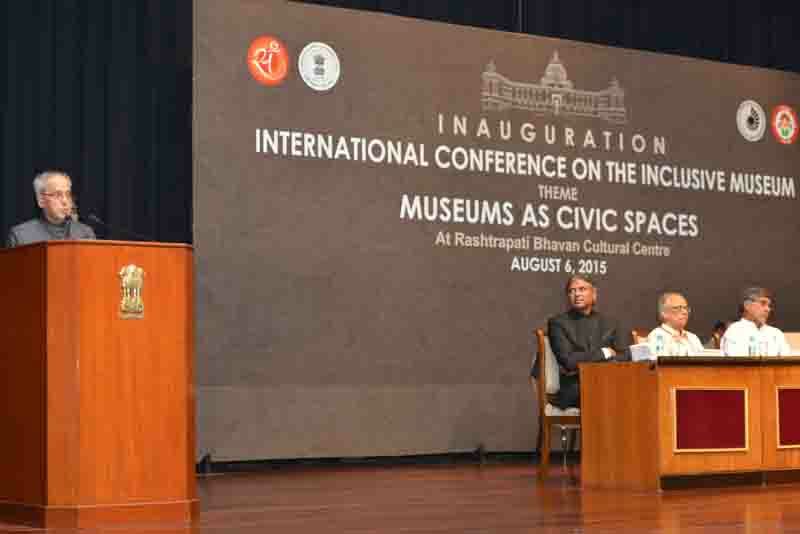 The topic of the conference - 'Museums as Civic Spaces’- , as I stated earlier, is apt as it builds on the notion of the inclusive museum as an inspirational space that is created and recreated on the basis of its context and relevance to diverse stakeholders. It liberates museums from the past legacies of a restricted audience and invites people with different socio-cultural backgrounds to come and experience their history and living spaces. The challenge before museums today is to address cross- cultural issues in a manner which is inclusive and which would be accepted and appreciated by varied segments and strata of society. In the 21st Century, museums can open up vital new spaces in society where a wider variety of visitors and sectors can engage with their resources and practices. Museums can serve as catalysts to integrate traditionally separated sectors such as schools and their communities for making learning more applicable to real world situations. Museums necessarily have to address the changing needs of atech-savvyyounger generation which has the ability to access the whole world in their palms today. Today’s museums, showcasing unique collections, subsidized by states or major patrons, are working harder than ever before to raise their funding and attract more visitors from different segments of society. They are confronted by several questions today such as how to deal with the forces of globalization and privatization, adaption to increasingly commercial forms of culture and leisure, approaches and strategies for appealing to local visitors and tourists, etc. These are fundamental issues facing contemporary museology which will be addressed by speakers from different parts of the world during the course of this Conference. Your inputs during the conference will be of immense value and shall add to our existing body of knowledge in this area. They will also hopefully guide us in the process of making our museums contemporary and inclusive. We would at the same time do well to remember the words of Dr. Sarvepalli Radhakrishnan who said and I quote, "The museum demonstrates that history is a dynamic process and we can shape the future…… In these days of trials and errors a visit to a museum will give us tranquil hope, a kind of heroic cheerfulness, a grateful expansion of the heart”. (unquote). I am confident that the recommendations of this Conference will be equally well received by both policy makers and practitioners. I wish the participants and the deliberations of the Conference all success.